Start cards generally represent the creator of the fanfiction being "written" as the game is played. When you play with a different Start card, you change the author, which of course changes how the story is written, which translates into changing how the game is played, even if only slightly. This can be through not giving your Start card a power, or if you are giving it a power, making it a relatively minor one. 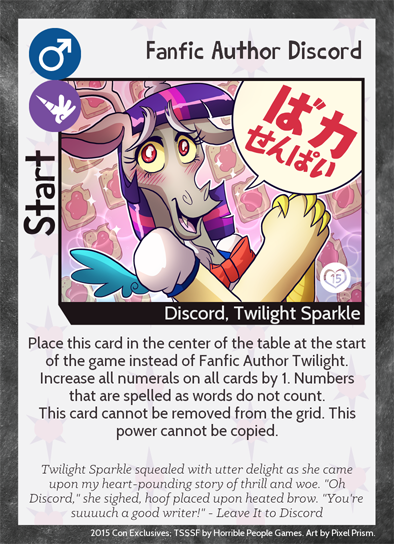 If you're going the no power route, you should strongly consider making this new Start Card some form of Twilight Sparkle. The game is named after her after all! Mechanically, Core Deck is heavily designed with her in mind as well. 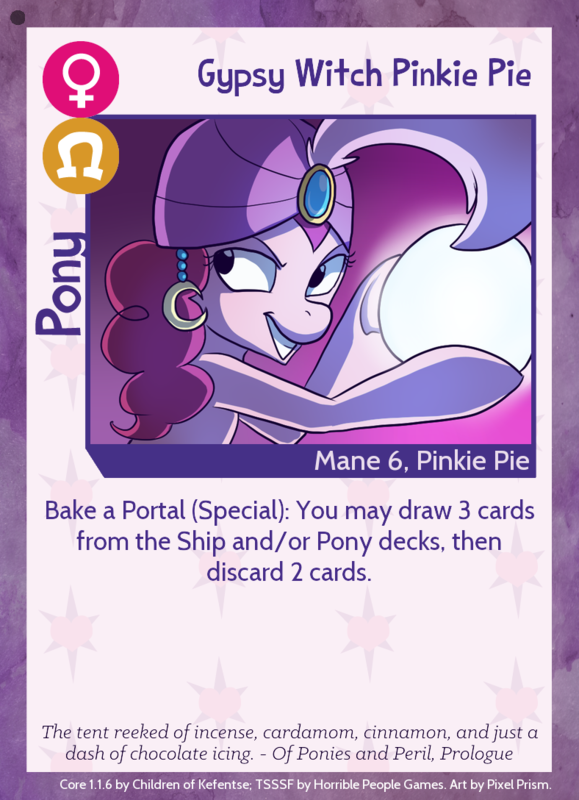 Eight Goals in Core specifically refer to her, while six others care about things she normally has related to her original card (race, gender, etc.). 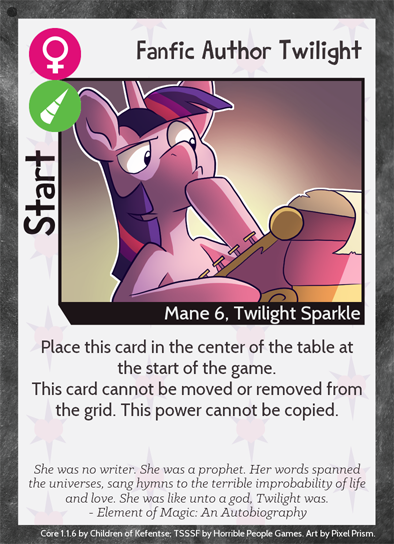 This is not to say you couldn't make a regular, no power Start card without Twilight, just know that the game will be harder if you do so. I don't feel like most would consider this fun, especially seeing as a new character would imply some fun new power that comes along with them! So just make a different flavored Twilight? That sounds pretty boring, right? Wrong! There's plenty of little things you can change and make an interesting Twilight! You could make current Twilight! That is to say, Twilight as an alicorn. Princess Twi as is would function identically to Fanfic Author Twilight, except her race would now be Alicorn. While this makes some Goals harder to achieve, like Pretty Pretty Princess, it makes Twi eligible to achieve new Goals she couldn't before, like Pomf! 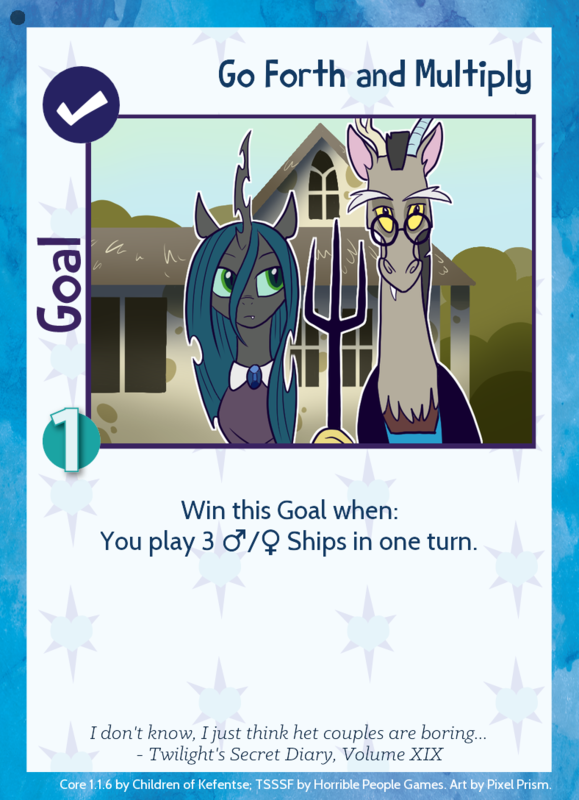 Changing Twilight's gender can also affect the game in an interesting way. You might not be able to achieve "Just Experimenting" as easily now, but there's plenty of females in Core anyway! What you can get is a quick My First Slash or Go Forth and Multiply achieved with little effort! 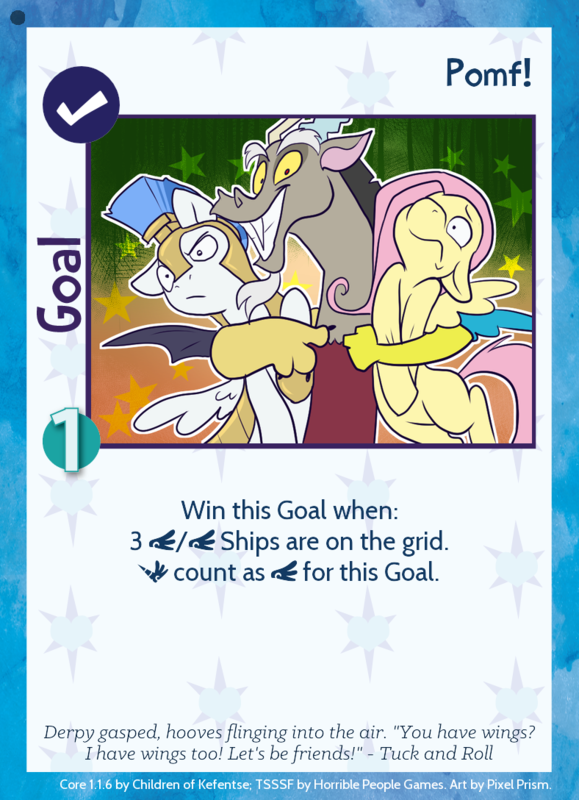 So what if you don't want a Twilight Start card, but don't want to drastically change the game? As we've seen above, even the slightest changes can affect the game in some ways. Keeping your non-Twilight character as close to Twilight as possible in regards to Race, Gender, and Keywords is the best way to go if you don't want to shake things up too much. One of those three things could change, but as long as you keep at least two intact, you should be fine. So what if you want to make some waves? Hold onto your Ships, we're getting into the most difficult, but possibly most rewarding type of Start Card design. It's also my favorite type and the one I have the most experience with! The game changer! Woah, woah, woah. No Twilight. Also, that's a lot of text there. Like breaking-the card-generator-and-resorting-to-In-Design-then-rewording-the-card-and-still-getting-close-to-the-flavor-text amounts of text. No need to worry, I've got everything under control! My detective Rarity was designed with the difficulty increase mentioned earlier in mind. 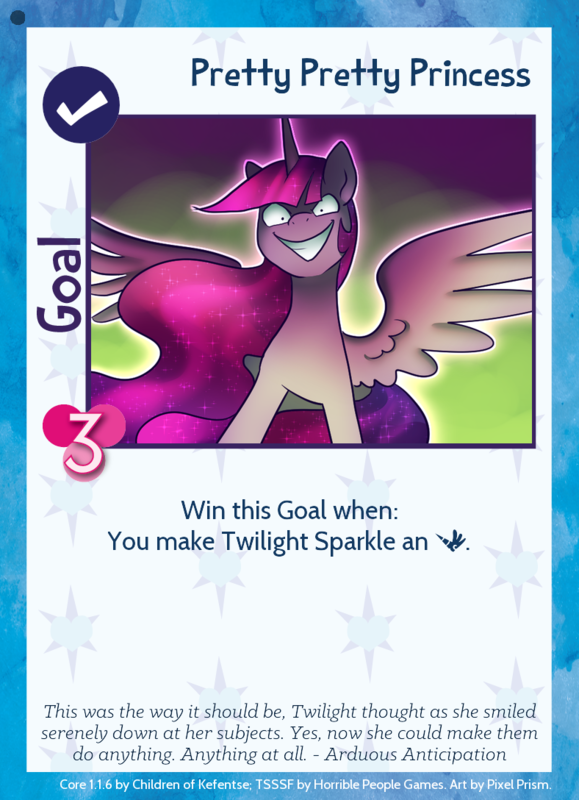 Not being Twilight inherently makes the game harder, but that's the intent here. The more cards you play with the harder she gets, but being able to play with every card you own is a luxury that other Start cards might not allow for as easily. Couple that with an invisible timer and emphasis on cooperative play and you have a pretty solid card that can give players a run for their money. 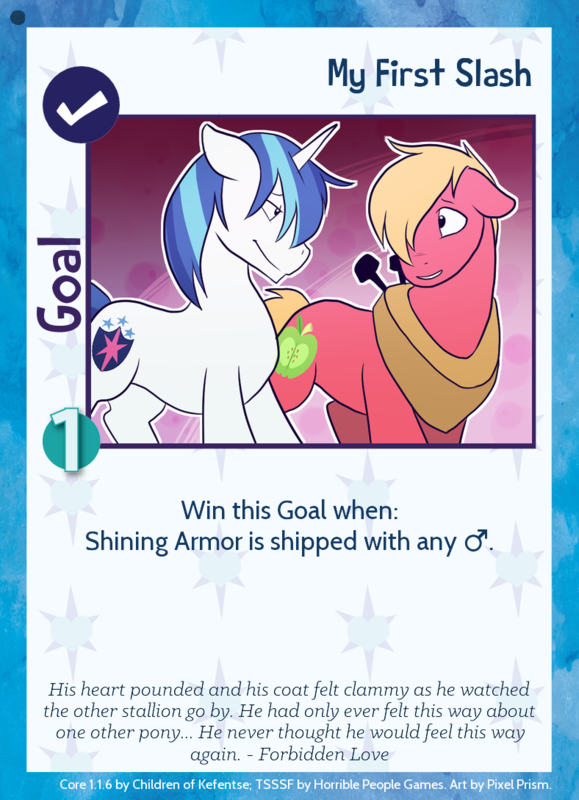 It also acts as a great tutorial Start card since players get to work together and see how the game works in a less competitive environment. As for the flavor, it’s a bit different than a normal Start card. Instead of writing fanfictions, Rarity is investigating a series of fanfictions being written by the players. Either the players get away with the fanfiction equivalent of murder or our intrepid detective stops them before anymore sinister OTPs get out to the public. The two points that minor changes and game changers have in common, is balance. With small changes, you need to make sure that while you might be making some Goals harder to achieve, that others are easier. With bigger game changers, you'd better be putting the time into testing to make sure everything works as intended! 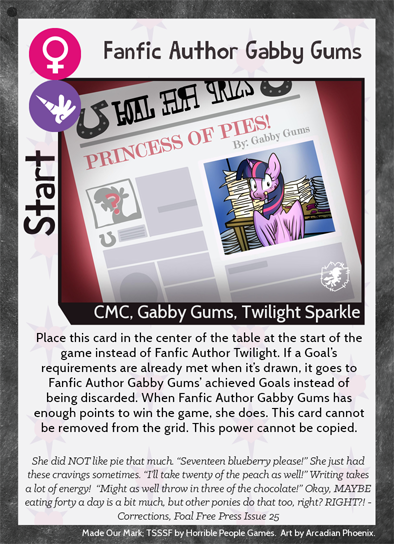 My Gabby Gums card is a result of not quite enough testing on my end. While she may look interesting and game changing, she really doesn't do much if you know how to play Shipfic. 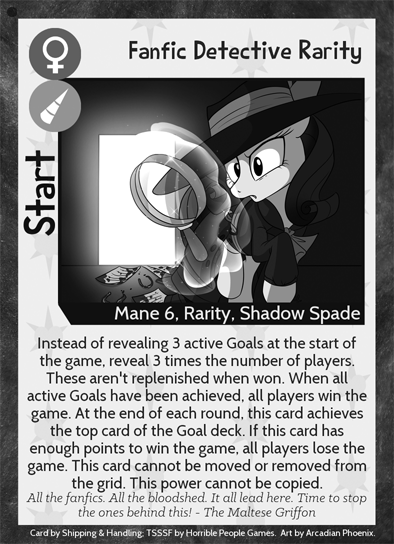 With enough knowledge, you'll know what Goals exist and can move Gabby or other Ponies around her to minimize her Goal scoring. While I have been in at least one game where she's won, it's definitely an exception and doesn't happen as often as I'd like. One could argue the classic game ideal of "The threat of power is power". The fact that she could make you play differently is somewhat interesting, but you don't exactly have to go out of your way to stifle her. HPG brings us the master of chaos himself, and boy does he make some. As worded, he causes all numbers on cards to increase by one. This includes himself. You might have noticed he has a number on his card, the card that increases all numbers. So his "1" increases to "2", then "4"...I think you see where this is going. I assume as intended, it is supposed to increase all other numbers by one and stop there. Even as intended, Goals that were designed for specific point values become worth more, so you could win the game with much less effort. 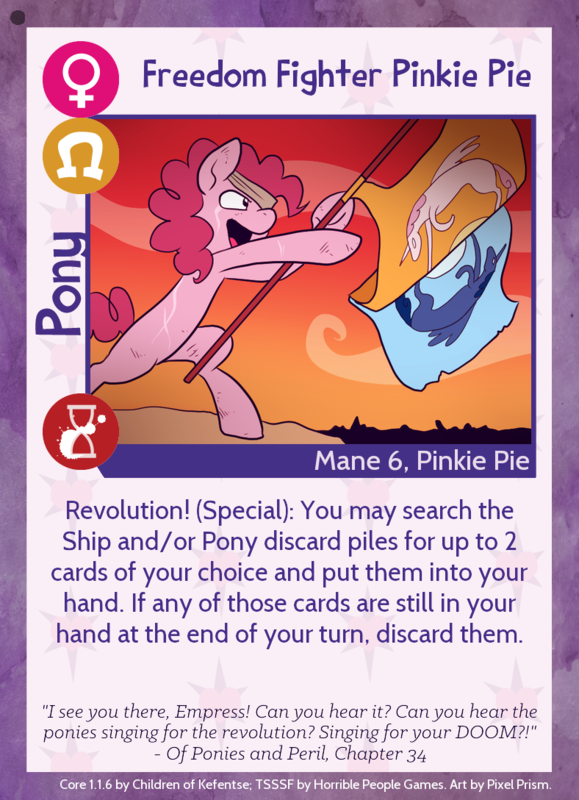 Cards that were already really good, like Gypsy Witch Pinkie Pie and Freedom Fighter Pinkie Pie, become borderline unfair. Be aware of the consequences when bringing this guy to the center of your table. You may have noticed I've been mentioning Core Deck a lot. It is essential to consider Core Deck when determining balance, as it is always used. If you make sure that your card works with Core, it should be set to work with most other cards! 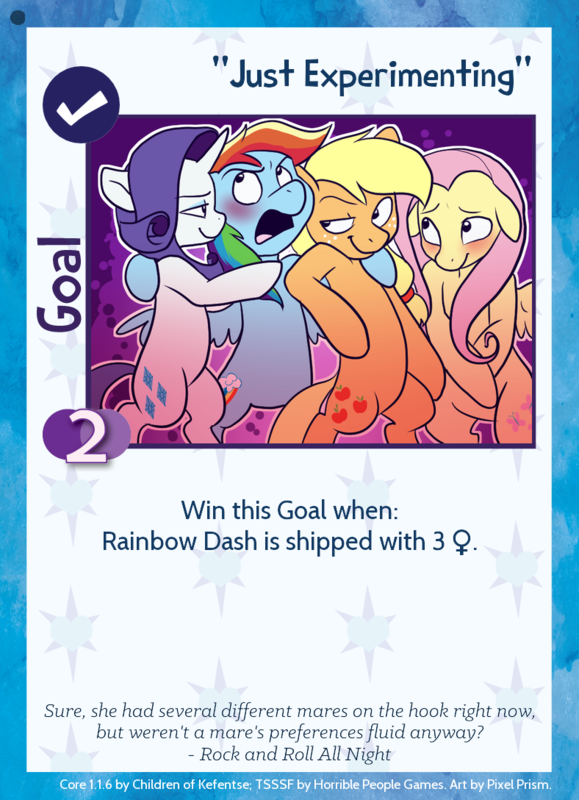 While it's nice to have a Start card that helps you win a lot of Goals in Core, it's not completely necessary to bend over backwards to Core set. You can have a Start card that cares about another set, while still not making Core too much harder to play with. So that’s all I have to say about Start cards for now! Go out and make some really interesting Start cards! If you come up with any new ideas, feel free to run them by myself and others on our Discord channel. Have more to say about Start cards or would like to discuss this article in general? Head to our forums for discussion. Next time we’ll will be talking about Ship cards!